Hand bound books, fine leather sketchbooks & journals, bespoke bindings, artist editions, rebindings, book repairs & workshops since 1996. 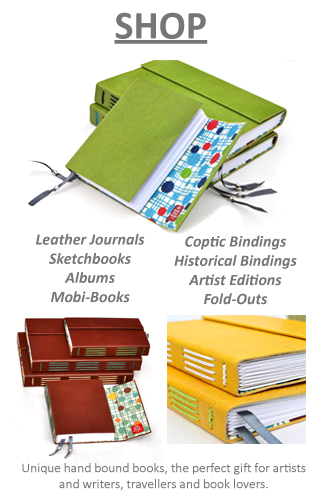 SHOP Leather journals, sketchbooks, albums, Coptic books, historical bindings, Artist Editions, Mobi-books and fold-outs. Unique, hand bound books, the perfect gift for artists and writers, travellers and book lovers. Bookbinding tools, tool kits, bone folders, hand marbled paper, Crawford waxed linen threads & cords, bookcloth, Asahi Japanese bookcloth, Bookbinding PVA archival glue, pre-cut book kits and more. 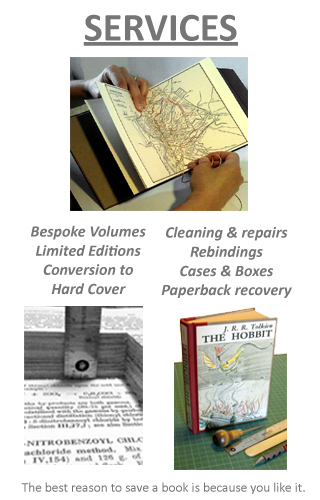 SERVICES, REPAIRS & REBINDINGS Much can be done to restore a beloved favourite book to a strong and reliable condition. Our objective is to return the book as closely as possible to its original form and secure the structure. Cloth or Leather available. Slip cases, archival boxes made to order. Projects include cherished childhood books, family bibles, geneological records, poetry, unique cookbooks, crossword dictionaries, favourite novels, out of print books, paperback to hard cover, slide cases, wrap-around portfolios and more. Each book is unique. COURSES & WORKSHOPS Progressive skills, accessible tuition, detailed information, materials included, tools provided. 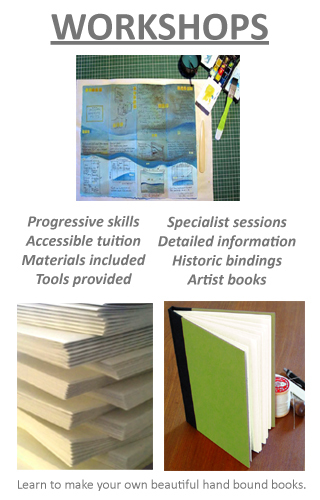 Specialist sessions and short courses in Book Arts and bookbinding. Learn to make your own beautiful hand bound books. Had the day before yesterday in the FDList pharmacy, because my blood pressure has increased to 280 and in the hospital I was switched to the Atenol 50 mg, which I should take twice. It was not successful after four hours and the blood pressure was back to 170/100 and I went home at my request. ARTIST EDITIONS We are very happy to work with artists and writers to create unique volumes and limited Artist Editions for exibition and sale. We’ve worked with many unusual book ideas and are open to a wide range of structures and materials for special clients. Possibilities include reclaimed and altered books, renewals, reprints and sculptures in book form. We seek out the well-used and much-loved and enjoy the extraordinary as well as the everyday. Every project is different. Use the CONTACT form to describe your idea.